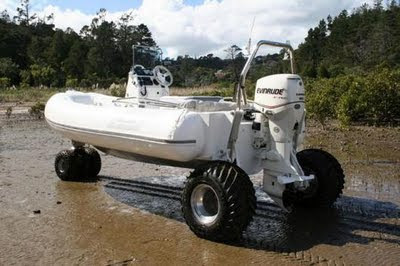 Sealegs International:It has developed a new all-terrain version of its amphibious marine craft. The new 5.6m Sealegs All Terrain Amphibious Craft (ATAC) can carry a payload of 500kg (6 adults) on land and sea will sell for US$65,000. The Sealegs ATAC has a top speed of 10kmh on land but is far more capable as a water-going amphibian. Once driven into the water, the Sealegs ATAC hydraulically retracts its wheels to allow speeds of up to 60kmh. Later this year Sealegs will make an attempt on the world record for the fastest crossing of the English Channel by an amphibious vehicle. Gizmag has covered a wide range of amphibious vehicles in recent times, including the original launch of Sealegs, the Gibbs Aquada Sportcar, the Gibbs Humdinga 4WD amphibian, the Platypus 4WD amphibian, the Rinspeed Splash, the Phibicat and the Amphicar. The ATAC is ideal for delicate ecocultures, as its balloon tyres exert an extremely low ground pressure which is less than that of a human footprint. This is achieved by having two special purpose-built 31 inch by 18 inch hydraulically powered wheels on the rear and three steerable tyres at the front. These enable the Sealegs ATAC to traverse estuary mud flats and soft shingle beaches that are beyond the reach of conventional boats and trailers. Sealegs CEO Mr David McKee Wright says, “We are very excited about the new market possibilities the Sealegs ATAC opens up. People who have waterfront property with soft terrain between them and the water at low tide finally have a boat launching solution for the first time ever”. On land the Sealegs ATAC has a ground clearance of 425mm which allows it to climb inclines of over 25 degrees.